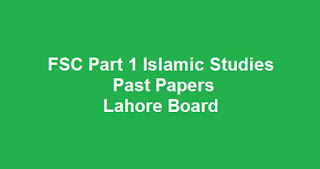 Download FSC Part 1 Islamic Studies Past Papers for BISE Lahore Board and for All Past Years annual exams. FSC part 1 past papers for Islamic studies are uploaded right here on this page. If you are satisfied with this list of Islamic studies fsc part 1 past papers than share this page with other students and if you want more than comment below.